Dubai: The Ministry of Human Resources and Emiratisation (previously known as Ministry of Labour) is fully committed to ensuring that employer-employee relations and labour rights are maintained for the private sector. However, there are still many companies that are short-changing workers by hoodwinking the government-backed Wages Protection System (WPS), a Gulf News investigation has found. Some estimates indicate that nearly 50 per cent of all small private construction and transport companies circumvent the system to pay workers nearly 40 per cent less than what’s rightfully due. The Wages Protection System (WPS) is an electronic salary transfer process that allows companies and institutions to pay wages via registered agents such as banks, exchange houses and financial institutions, using their WPS code. As soon as a registered agent receives an employee’s salary transfer instruction, it beams an electronic notification to the Wages Protection System, which then sends the worker’s salary file to the agent for payment. Each employee is issued an electronic card to withdraw his salary from the agent’s cash dispensing machine. After being made mandatory in 2017, WPS now covers more than 321,000 institutions, accounting for around 94.7 per cent of private sector firms. However, many firms have found a way to cheat the system. To meet government requirements, these companies transfer the agreed upon wages on the specified date into the worker’s account, but retain ATM cards. “It’s like pulling the wool over the eyes of the authorities. On paper, the workers are getting full wages on time, but in effect they get anywhere between 35-40 per cent less and that too weeks after pay day,” said a lawyer, who specialises in labour related cases. 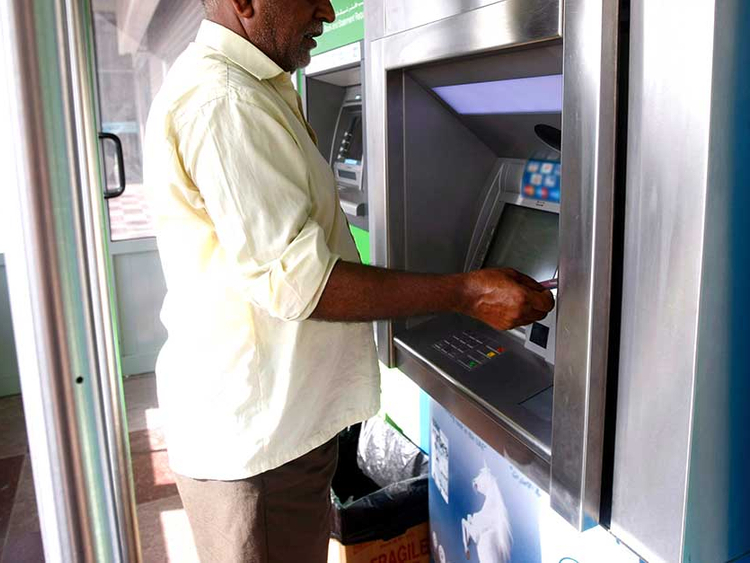 Several blue-collar workers interviewed by Gulf News said their ATM cards remain with their employers. “I don’t even know what my card looks like because it has always been with my boss. In my labour contract, my salary is mentioned as Dh2,000. But I am paid Dh1,500 in cash during the second week. There have been times when my salary has been delayed by a month,” said Mukasa, 29, who hails from Uganda and works as a security guard in Dubai. Similarly, Pakistani car mechanic Asif Munawwar, gets Dh500 in hand although his salary is Dh1,000. “My employer takes me to an ATM machine to withdraw my salary but gives only half of it,” he said. In many cases, the financial institution has no interface with individual workers. Instead, it treats the employer as the primary client whom they charge Dh10 per cardholder per month. At the beginning of the month, the company’s representative withdraws money from the ATM cards of workers and hands out a portion of their salaries. A manager at a financial institution said he has come across instances where companies don’t even transfer one dirham of the principal salary amount. “Instead, they strike a deal with the agent by paying him additional commission or service charge. In return, the agent processes salary files to fulfil ministry obligations. The actual transfer of salary between the employer and the agent never takes place. But new Central Bank regulations prohibiting collection of salary from branches might put an end to this practice,” he said. Ali Haddad, who heads Haddad & Associates and is also chairman at Lawyer Business Group, said nearly half of all small construction firms circumvent WPS. “Withholding ATM cards is the norm. Sadly, there is little these people can do. They can’t complain because they have nothing by way of evidence. The WPS shows their salary has been transferred into their account. So they have no case,” said Haddad. Devanand Mahadeva, a lawyer at Goodwins Law Corporation, said he has also come across instances where even skilled professionals have been shortchanged. Sultan Al Sa’adi, Director of the Inspection Department in the Ministry of Human Resources and Emiratisation, said companies found trying to evade WPS will be fined and referred to judicial authorities. In response to a Gulf News query, Al Sa’adi said employers who enter inaccurate data in WPS will also be dealt with severely. “The employer shall be summoned and investigated, and the penalties and administrative fines shall be applied if the violation is in accordance with the Council of Ministers Decision No. 15 of 2017 Article 3. Entry of incorrect data in the Wage Protection System for the purposes of evasion or circumvention of the provisions of the Regulation is fined by (Dh5,000) for each worker and a maximum limit of Dh50,000 in case of multiple workers,” he said, adding that salaries not remitted within 10 days of the pay day are considered late. Al Sa’adi said workers who feel cheated by their employers could report wage-related violations to Ministry of Human Resources and Emiratisation’s My Salary/Ratibi Service in strict confidentiality. “If the ministry is convinced that an establishment is not committed to paying wages through the electronic system, then penal measures will be taken against the establishment and judicial authorities will be informed while the workers will be allowed to move to another employer,” he said.